We feel extremely honored to share this news that our company’s developed application covered by a leading newspaper of Rajasthan. 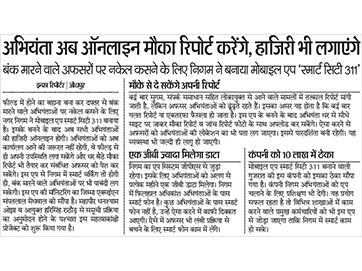 We got featured on Dainik Bhasker of 8th January 2015 edition for launching our application Jodhpur-311. The application will allow government engineers and officers to send real-time inspection reports with date, a photo of the field and GPS location. Officers can also mark their attendance online, allowing management to track down the attendance of their staff members. Moreover, it streamlines the workflow of the government department and makes it easy to report and mark attendance!